Signal reconstruction algorithms can now be developed more elegantly because scientists at the Max Planck Institute for Astrophysics released a new software package for data analysis and imaging, NIFTY, that is useful for mapping in any number of dimensions or spherical projections without encoding the dimensional information in the algorithm itself. The advantage is that once a special method for image reconstruction has been programmed with NIFTY it can easily be applied to many other applications. Although it was originally developed with astrophysical imaging in mind, NIFTY can also be used in other areas such as medical imaging. Fig. 1: Signal reconstruction with NIFTY in one, two and spherical dimensions (upper, middle and lower rows). In each row, the original signal is shown on the left, the noisy data in the center and the signal reconstruction from the data on the right. The same NIFTY code generated all three examples. Fig. 2: NIFTY reconstruction of a highly distorted photograph of the lunar surface. 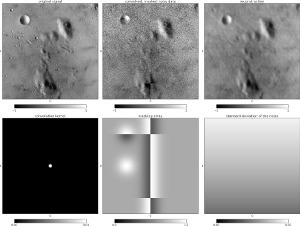 Top row from left to right: original image (Source: USC-SIPI database), data, and reconstruction. Bottom row shows disturbances in the data, from left to right: grain size of the smoothing, patterned mask and inhomogeneous structure of the noise distribution. Behind most of the impressive telescopic images that capture events at the depths of the cosmos is a lot of work and computing power. The raw data from many instruments are not vivid enough even for experts to have a chance at understanding what they mean without the use of highly complex imaging algorithms. A simple radio telescope scans the sky and provides long series of numbers. Networks of radio telescopes act as interferometers and measure the spatial vibration modes of the brightness of the sky rather than an image directly. 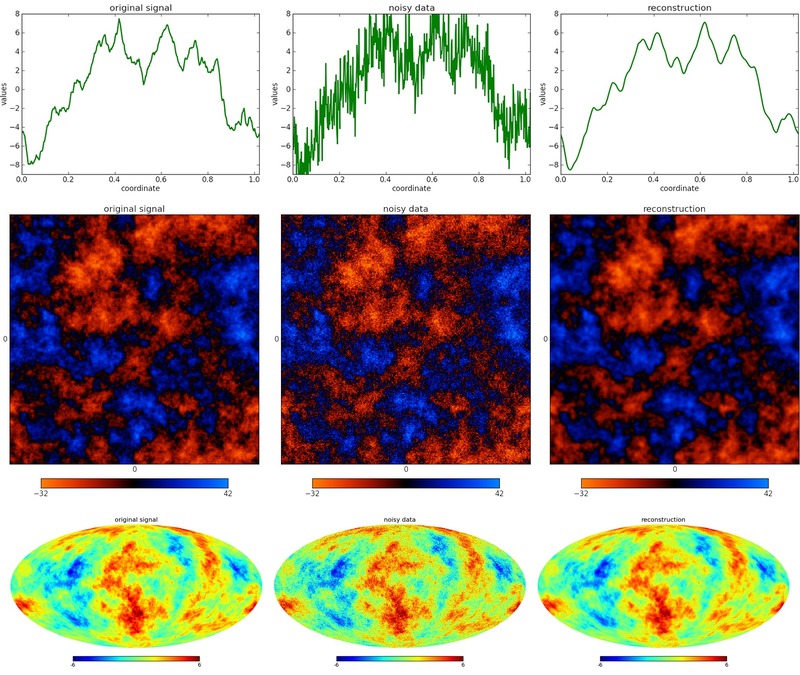 Space-based gamma ray telescopes identify sources by the pattern that is generated by the shadow mask in front of the detectors. There are sophisticated algorithms necessary to generate images from the raw data in all of these examples. The same applies to medical imaging devices, such as computer tomographs and magnetic resonance scanners. 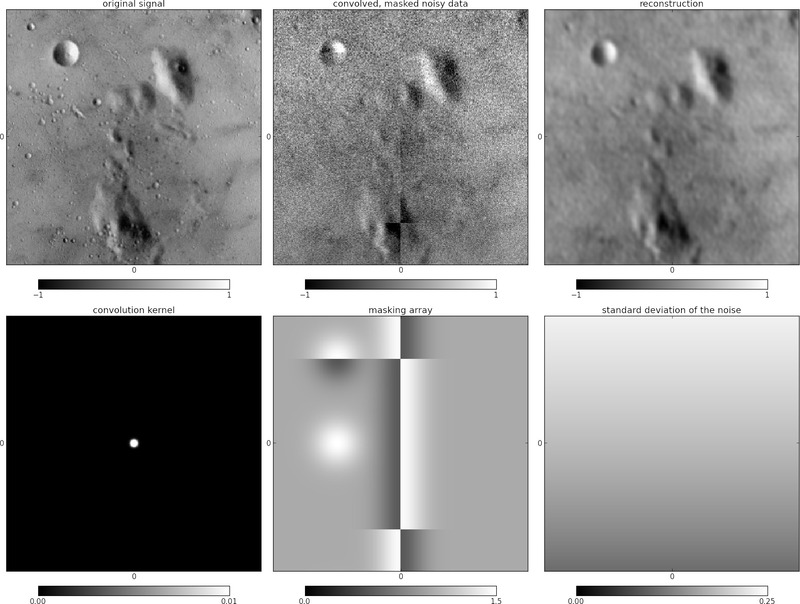 Previously each of these imaging problems needed a special computer program that is adapted to the specifications and geometry of the survey area to be represented. But many of the underlying concepts behind the software are generic and ideally would just be programmed once if only the computer could automatically take care of the geometric details. With this in mind, the researchers in Garching have developed and now released the software package NIFTY that makes this possible. An algorithm written using NIFTY to solve a problem in one dimension can just as easily be applied, after a minor adjustment, in two or more dimensions or on spherical surfaces. NIFTY handles each situation while correctly accounting for all geometrical quantities. This allows imaging software to be developed much more efficiently because testing can be done quickly in one dimension before application to higher dimensional spaces, and code written for one application can easily be recycled for use in another. NIFTY stands for "Numerical Information Field Theory". The relatively young field of Information Field Theory aims to provide recipes for optimal mapping, completely exploiting the information and knowledge contained in data. NIFTY now simplifies the programming of such formulas for imaging and data analysis, regardless of whether they come from the information field theory or from somewhere else, by providing a natural language for translating mathematics into software. The NIFTY software release is accompanied by a publication in which the mathematical principles are illustrated using examples (see Figures 1 & 2). In addition, the researchers provide an extensive online documentation. The versatility of NIFTY has already been demonstrated in an earlier scientific publication on nonlinear signal reconstruction and will certainly be helpful in developing better and more accurate imaging methods in astronomy, medical technology and earth observation. NIFTY has been developed by Marco Selig, Michael Bell, Henrik Junklewitz, Niels Oppermann, Martin Reinecke, Carlos Pachajoa, Maksim Greiner and Torsten Enßlin at the Max Planck Institute for Astrophysics. Marco Selig, the main developer, is currently a PhD student under the guidance of Torsten Enßlin investigating information field theory-based imaging for high-energy photons. NIFTY is an object-oriented Python library that relies on complex numerical operations on extremely powerful external routines in C, C++ and Cython. The code is freely available under a GPL open source license. Information field theory is a focus of the research group of Torsten Enßlin.